This past January, the U.S. Congress received a report that began with a stern warning: “Immediate action is required to address the interdependent challenges of aviation noise, local air quality, and climate impacts. Environmental impacts may be the fundamental constraint on air transportation growth in the 21st century.” The report summarized the input of a broad range of stakeholders, and was drafted on behalf of the Secretary of Transportation and the Administrator of NASA by faculty and research staff members from the MIT Department of Aeronautics and Astronautics and the MIT Engineering Systems Division. The System for Assessing Aviation’s Global Emissions is a high fidelity computer model used to predict aircraft fuel burn and emissions for all commercial flights globally in a given year. The model is capable of analyzing scenarios from a single flight, to operations on airport, country, regional, and global levels. SAGE can dynamically model aircraft performance, fuel burn and emissions, and capacity and delay at airports, as well as forecasts of future scenarios. SAGE has also been used to analyze the sensitivity of those inventories to changes in operational, policy, and technology-related scenarios. 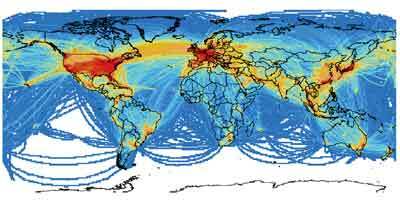 This output from the FAA System for Assessing Aviation's Global Emissions (SAGE) shows the world-aide distribution of aircraft carbon dioxide emissions for 2000. The Volpe National Transportation Systems Center, MIT, and the Logistics Management Institute developed SAGE for the FAA Office of Environment and Energy. MIT’s principal contributions were the development of the aircraft and engine performance, fuel burn and emissions models, as well as assessment of uncertainty for SAGE as a whole. The United Nations Intergovernmental Panel on Climate Change recommends SAGE as a high-fidelity method for reporting national emissions inventories for aviation for obligations under the Nations Framework Convention on Climate Change. SAGE has also supported the work of the International Civil Aviation Organization, Committee on Aviation and Environmental Protection, appearing to date in 15 ICAO/CAEP information papers and other documents. In the last 35 years there has been a six-fold increase in the mobility provided by the U.S. air transportation system. At the same time there has been a 60 percent improvement in aircraft fuel efficiency and a 95 percent reduction in the number of people impacted by aircraft noise. However, because of the strong growth in demand for air travel, emissions of some aviation-related pollutants are increasing against a background of emissions reductions from many other sources. And, progress on noise reduction has slowed. Millions of people are adversely affected by these side effects of aviation. As a result of these factors and the rising value placed on environmental quality, there are increasing constraints on aviation operations. Airport expansion plans are delayed or canceled due to concerns about local air quality, water quality, and community noise impacts. Military readiness is challenged by restrictions on operations. Efforts to address climate change now include formal international consideration of taxes, emissions trading, and other measures for aviation. We are both proud and privileged to lead the Partnership for AiR Transportation Noise and Emissions Reduction, PARTNER, an FAA-NASA-Transport Canada-sponsored Center of Excellence. PARTNER is a research collaborative comprising 10 universities and almost 50 advisory board members. One of PARTNER’s greatest strengths is the advisory board’s diversity and inclusiveness. Its members include aerospace manufacturers, airlines, airports, national, state and local government, professional and trade associations, non-governmental organizations, and community groups, united in the desire to foster collaboration and consensus among some of the best minds in aviation. PARTNER pursues technological, operational, policy, and workforce advances to address aviation and environmental challenges. developing online resources to better inform the public about aircraft noise issues. PARTNER drafted the recent Report to the United States Congress: Aviation and the Environment: A National Vision Statement, Framework for Goals and Recommended Actions. More than one hundred stakeholders participated from 38 organizations spanning the aerospace industry, NASA, FAA, Environmental Protection Agency, Department of Commerce, Department of Defense, academia, state and local governments, and community activists. Perhaps the most significant accomplishment reflected in the report is a proposal for a National Vision Statement for Aviation and the Environment. This vision statement is supported by all of the 59 stakeholders who directly participated in drafting it. The National Vision specifies absolute reductions in significant health and welfare impacts from many aviation sources, reduced uncertainty in understanding other impacts, and global leadership for the U.S. aerospace enterprise in jointly addressing aviation mobility and environmental needs. This above image depicts the relationship between the recommended actions and the National Vision for Aviation and the Environment. 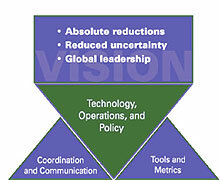 Technology, Operations and Policy represent a balanced approach to addressing aviation mobility and environmental needs. These are placed in an inverted triangle to signify that the balance is dependent on the supporting elements of Communication and Coordination, and Tools and Metrics. It is only with all three of these elements in place that the National Vision of absolute reductions, reduced uncertainty and global leadership will be achieved. To achieve this challenging vision, the report recommends three actions. The first is to promote coordination and communication among stakeholders. The second is to develop more effective tools and metrics for guiding policy decisions and for planning research investments. The third is to establish a vigorous program to develop specific technological, operational and policy options that support a balanced approach to long-term environmental improvements. These recommendations are the foundation for the Environmental Objectives in the Next Generation Air Transportation System plan. The report is available at http://www.partner.aero. Seven of our research programs are officially designated with the U.S. Office of Management and Budget as potentially “leading to highly influential scientific disseminations.” This designation is reserved for federally sponsored research programs with the potential to influence greater than $0.5 billion in federal expenditures (among other criteria). Special peer review processes are required before the federal government can adopt and disseminate the results of such research programs. MIT’s most prominent role within PARTNER is developing tools that provide rigorous guidance to policy-makers who must decide among alternatives for addressing the environmental impacts of aviation. We are collaborating with an international team to develop aircraft-level and aviation system level tools to assess the costs and benefits of different policies and R&D investment strategies. Currently, environmental policy assessments are largely compartmentalized, focusing, for example, solely upon noise, local air quality, or climate. Often the full economic costs and benefits, and the complex interdependencies, are not considered when evaluating policies and prioritizing research investments. In practice, well-intended changes in one domain may produce unintended negative consequences in another. For example, in 2004 the International Civil Aviation Organization adopted new certification standards for aircraft engine NOx emissions. The new standards represent a 12 percent increase in stringency to be introduced in 2008 and are designed to mitigate the local air quality impacts of aviation. ICAO estimated the cost of this increase in stringency to be approximately $5 billion. Aircraft and engines designed to meet this standard are expected to make compromises on fuel burn and weight, and thus, on climate and noise impacts. What will be the performance and environmental characteristics of future aircraft under different policy alternatives and market scenarios? How should we balance competing environmental objectives? What is a unit of climate change impact worth in terms of a unit of noise impact, or a unit of local air quality impact? And, how should we weigh these impacts against the economic costs of the policy, costs that ultimately are passed on to consumers of aviation services and can influence the profitability of aviation producers and producers in related industries? 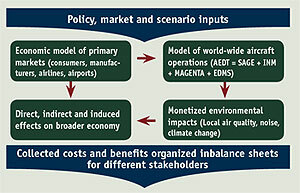 In order to select environmental policies and R&D options that balance societyís economic and environmental needs, national and intergovernmental agencies must have the ability to assess the complete impact of each suggested policy, accounting for potential interdependencies among market conditions, aircraft technology, air transport operations and local air quality, noise and climate change impacts. To accomplish this, the Federal Aviation Administration Office of Environment and Energy has launched a project to create a suite of software tools. The suiteís economic analysis function is known as the Aviation Environmental Portfolio Management Tool. MIT is leading the international APMT development team that includes participants from BB&C Consulting, Georgia Institute of Technology, MITRE-CAASD, MVA, Vital Link Policy Analysis, Volpe National Transportation Systems Center, and Wyle Laboratories. APMT takes aviation demand and policy scenarios as inputs, and simulates the behavior of aviation producers and consumers to evaluate policy costs. Detailed operational modeling of the air transportation system provides estimates of the emissions and noise outputs. Then, a benefits valuation module is used to monetize the health and welfare impacts of aviation noise, local air quality and climate effects. These modules jointly enable a cost-benefit analysis of policy alternatives. The effort to develop an APMT prototype began in February 2006. We are working to deliver a fully-functional simulation for consideration by the International Civil Aviation Organization, Committee on Aviation and Environmental Protection in 2007. The foundation for our work is the development of environmental and economic systems models that simulate aircraft and engine design practices, airline and consumer behavior, air transportation operations, noise, local air quality and climate impacts, and then monetize all of these effects using established practices for valuation of health and welfare impacts. Many components of our simulations are carried out using legacy codes, and the degree of fidelity of these codes can be staggering. For example, we model 450 individual aircraft types, track the current world fleet by tail number (80,000 airplanes), fly all flights in each year on detailed mission profiles (30 million flights per year), develop noise footprints, and assess local air quality impacts at 35,000 airports worldwide, estimate climate change impacts using impulse response functions derived from general circulation and carbon-cycle models of the global climate, and assess health and welfare impacts using concentration-response curves from epidemiological studies, noise and health valuation data, and detailed census and socio-demographic information. Within this work are some grand challenges that we are only starting to address. For example, given the complexity of the tools we are using to simulate the future behavior of the air transportation system and its economic and environmental impacts, how can we rigorously assess uncertainty? Moreover, how can we use our understanding of the sources for this uncertainty to actively manage the fidelity of our tools in a way that directly responds to a range of policy-maker needs? As we progress towards providing more rigorous information to policy-makers, how should the national and international processes for negotiating policy decisions be changed? And how should the regulatory structures be changed to reflect the interdependent character of the air transportation system and its relation to different environmental impacts? Ultimately, we hope to enable better policy decision-making by simultaneously evaluating the interdependent environmental impacts of the air transportation system, while providing a more complete assessment of costs and benefits. We benefit from working directly with the key U.S. policy-makers. Indeed, our relationship with our sponsors is not one marked by a few technical reports and site visits per year, but rather as many as five teleconferences and 50 emails each week. This direct engagement with the policy-making community presents both opportunities and challenges. The opportunity is that our analyses and simulations will influence multi-billion dollar decisions that can have profound and far-reaching impacts. The challenge is that our work is subject to a high level of political sensitivity and scrutiny. All of this adds to the fun and excitement. Our ability to simulate the entire aviation system and its environmental impacts provides us with a unique opportunity to identify fundamental research problems. As an example, while aircraft contribute only 0.01 percent to the U.S. national particulate matter inventory, PM has a relatively high health impact (health costs are around $60,000/metric ton, versus $2000/metric ton for NOx and $5-$125/metric ton for CO2). Our assessments show that the health and welfare impacts of aviation PM are similar to those of NOx. However, while much is known about aircraft NOx emissions, little is known about PM emissions and their relationship to engine design and operating conditions. Emissions from fossil fuel combustion typically contain not only hard particles (soot), but also minor fractions (parts per million and parts per billion) of gases such as SO3. SO3 reacts with water to form H2SO4 and then condenses — forming very small volatile particles (these particles range in size from several nanometers to tens of nanometers in diameter). We have developed a probabilistic multi-attribute impact pathway analysis for valuing, in a commensurate way, the different risks to health and welfare from aviation. Assessments are based upon explicit valuations of the environmental costs of noise, local air quality, and climate change, enabling firms and government agencies to differentiate among new technologies, allocate limited budgets for research and mitigation, and evaluate the comparative efficacy of policy options. For each step, from demand estimation to the evaluation of willingness to pay for environmental amenities, best practice methods and data are employed. Uncertainties are treated probabilistically using Monte Carlo simulation to generate cost distributions. An example result is shown below for the 96 largest airports in the United States. (Note the different monetary scales.) Our results point to three conclusions. First, aviation particulate matter emissions result in air quality impacts roughly similar to aviation NOx emissions. 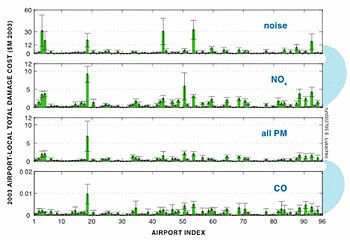 Second, aviation noise and emissions impact at the airport local scale lead to similar damages across the majority of airports except for a few locations where aviation noise is dominant. Third, including the costs of climate change attributable to aviation (not shown), emissions are associated with higher damage costs when compared to noise. Noise and local air quality damage costs by airport for 2003. These very small particles may pose the greatest health concern because they can be entrained deep into our lungs. Fine volatile particles may account for as much as half of the total PM mass emissions and are regulated under the U.S. Clean Air Act, and are not unique to aviation. However, in contrast to those of automobiles and powerplants, aircraft engine emissions are exhausted at higher temperatures, so the nucleation, condensation and coagulation of the volatile particles differ. Measurements have only just begun to characterize these differences. We have contributed to understanding the differences by developing (in collaboration with Aerodyne Research Incorporated) detailed numerical simulations of the fluid mechanics, chemistry, and particle microphysics within the engine, the exhaust plume, and in the sampling probes and lines employed in measurement campaigns. Our accomplishments include identifying an important role for turbine design (in addition to combustor design) in determining emissions of SO3. We also made the first estimates of the effects of engine design and operating conditions on volatile PM emissions, and recently demonstrated that some experimental techniques used to assess PM emissions must be improved. Through these and other research efforts, MIT Aero-Astro is playing a leading role in developing means to balance society’s demand for air transportation and environmental quality. Our work requires a challenging combination of breadth and depth, including knowledge of combustion, emissions, and noise; propulsion and aircraft system engineering; transportation system design and operation; environmental sciences (e.g., atmosphere, biosphere); health sciences (e.g., epidemiology and toxicology); environmental and aviation law; environmental economics; policy and business decision-making; and risk and uncertainty. It is through It is through the unique combined talents of our graduate students, research staff members, and national and international collaborators that we address these problems. Ian A. Waitz is a professor in the MIT Department of Aeronautics and Astronautics and the Director of the Partnership for AiR Transportation Noise and Emissions Reduction (PARTNER). He is a fellow of the AIAA and an MIT McVicar Faculty Fellow. He may be reached at iaw@mit.edu.